A world-renowned master in the kitchen and a charismatic personality, Wolfgang Puck is a dynamic “chef-lebrity” who is globally revered for his combination of classic cooking techniques and the modern fusion cuisine he pioneered in his iconic restaurants all around the world. All of the accolades that have ensued are decidedly well-earned, given that he began his formal kitchen training at just fourteen years of age with the encouragement of his mother—herself a chef in the Austrian town where he was born. After honing his craft at some of the finest restaurants in France and, subsequently, in the United States, Wolfgang arrived in Los Angeles in 1975, when he took the city’s culinary scene by storm, rapidly gaining favor with the Hollywood elite. His dynamic personality and culinary brilliance, which bridge tradition and invention, quickly made his food a magnet for the rich and famous and himself an A-list star in his own right. 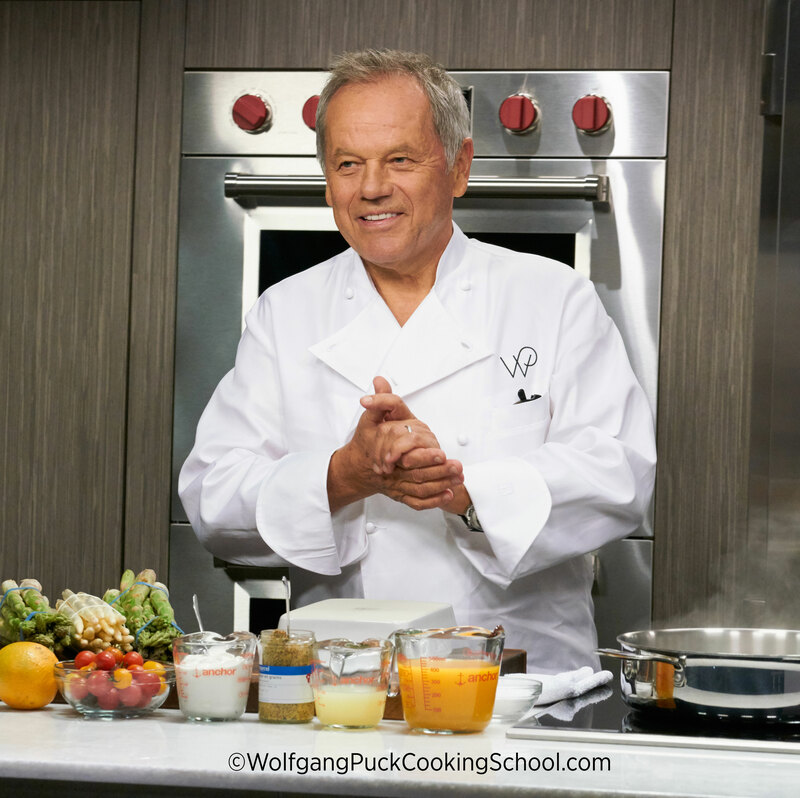 Driven by a genuine love of his craft and a passion to share his lifetime of professional knowledge with as many home cooks as possible, Wolfgang has added yet another venture to his credit: the Wolfgang Puck Online Cooking School. This digital destination is rich with beautiful, original, entertaining and inspiring high-definition videos that capture Wolfgang’s expertise and joy in the kitchen. The comprehensive, ever-growing online collection of instructional recipe-lessons, how-to techniques and engaging video cooking courses provides members with easy-to-learn teachings on how to prepare diverse dishes and learn culinary practices in the comfort of a home environment. Given that Wolfgang seemingly never stops working or creating in one form or another, I was curious to know how he enjoys the fruits of his labor in his “down time.” Hungry for enlightenment, I connected with Wolfgang for a conversion that reveals his tasty take on luxury living—and, not surprisingly, more planned professional endeavors up ahead. MK: What does the word “luxury” mean to you? WP: I remember when I was a young chef in my 20s, new to the United States, the idea of luxury to me meant having my own big convertible American car, which I drove across the country to settle in Southern California. Now, in my mid-60s, luxury to me is not a material achievement but a personal one: having the time to enjoy the company of the people I love—my wife Gelila, our sons Oliver and Alexander, and my two grown sons Cameron and Byron. MK: What do you love to splurge on? WP: My personal philosophy of good cooking, a concept I teach in every single video recipe class in my new Wolfgang Puck Online Cooking School, is that you always start with the best-quality ingredients and then cook them in ways that highlight and intensify their natural flavor, aroma, color and texture. So, in general, I’d have to say that I like to spend money on good-quality ingredients, especially if they offer pleasures I can share with my family, my friends, and the guests in my restaurants. I might invest thousands of dollars to buy the best white truffles of the season, so we can offer shavings of them on pastas or pizzas or other dishes in our restaurants. When I’m dining out myself, I love to drink really good wine. MK: What does your travel schedule look like up ahead? WP: I do a lot of travel for my businesses, with new restaurants opening up all the time around the world. I’ve found it fascinating to visit the new locations of our restaurants in Dubai, and Istanbul and Singapore. We have a new Wolfgang Puck restaurant opening soon in the Disneytown district of the new Shanghai Disney Resort, and I can’t wait to visit there. MK: What is your favorite dish and who cooks it? WP: I have many good friends who are chefs, and I don’t want to hurt anyone’s feelings by choosing one or the other as the one who cooks a favorite dish. But that doesn’t mean I can’t answer this question, because some of my all-time favorite dishes were ones that my mother and grandmother cooked for us when I was growing up. One of them was my grandmother’s giant Austrian-style ravioli filled with potato, cheese and fresh herbs, served topped with freshly grated cheese and brown butter. She made it for us almost every single week. When I recently filmed a lesson in how to make that dish for my online cooking school, I actually got choked up, reminiscing about how she made it, as I recorded the dish for the members who watch online. Good food has that kind of power to bring back memories. MK: What is your best tip for living fabulously? WP: More and more, I’m aware how important it is to eat healthfully and to exercise. Healthy food and delicious food aren’t mutually exclusive, and I certainly teach ways to achieve both goals at once in my online cooking school. I now try to work out in some way almost seven days a week, and the results show. As an Austrian native and a U.S. citizen, I love to ski, and I do it better now, with much more stamina, than I did twenty years ago. MK: Have your life’s luxuries been fairly consistent or have they changed over time? WP: As I mentioned before, even though I may now have more of the material success I had dreamed of when I was a young chef just starting out, the greatest luxury to me today is not material things but the time I get to spend with the people I love. And I think that cooking great food at home every day, as I love to teach people how they can do so easily through my online cooking school, is one of the secrets to achieving that goal. You’d be surprised by the effect a delicious home cooked meal—in which the home cook has learned through the simple tricks I share to easily turn ordinary everyday recipes into something extraordinary—can transform a family’s life by gathering everyone around the table. MK: What is the one luxury you would have the hardest time giving up? WP: There’s no question about it: I’d have a very hard time giving up good food and good wine, especially when I’m enjoying them both in the company of the people I love. MK: How do you like to start your day? WP: I’m actually not a big breakfast person. But one thing I can’t do without is a great cup of espresso coffee—or maybe a macchiato, an espresso “marked” with just a dash of foam from steamed milk. I’ll brew it at home with our own espresso machine. That gives me enough fuel to drive my sons to school in the morning. MK: Are there any wardrobe items you can’t do without? WP: Most of my days and evenings I spend dressed in a classic white double-breasted chef’s jacket, personalized with my initials, WP, which also form my brand logo. But, being a chef, I find really comfortable shoes are a must. The make may vary, but it’s got to offer good support while also being made with soft leather that is easy on my feet. From our conversation, it’s certainly no surprise to learn that fine food and wine not only permeates, but essentially drives, nearly every aspect of Wolfgang’s life, from his personal and professional travels to his social endeavors to how he spends down time with his own family. Well, food, wine and sensible shoes, that is. As for his Wolfgang Puck Online Cooking School, which incidentally you may access at www.WolfgangPuckCookingSchool.com, whether you are a dedicated foodie, a home cook responsible for feeding a busy family, or a complete novice to the kitchen, his instructional videos will surely have you whipping up wonderful world-class fare in no time. Amid all of his extraordinary achievements there’s one undeniable truth: Wolfgang has mastered the recipe for success.